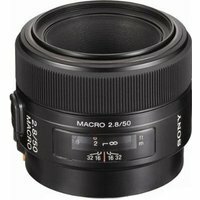 This compact 50mm standard macro lens offers superior focus for an extraordinary range, from infinity to life size, and can also be used a standard lens. With good descriptive performance for high-contrast, high-resolution imaging, and a circular aperture for a beautiful, defocused effect, the SAL50M28 lens from Sony brings the moment to life. Its built-in auto clutch (non-turning focus ring in AF) offers exceptional holding performance, while the equipped focus hold button and focus range limiter improves operation.